Okay, I promise that this isn't going to be another boring pvp story that talks about how we rampaged around our territory turning the Amarr into space goo. In fact, this is going to be a completely different story altogether. An amazing thing in militia, is that upon logging into Eve, you're never entirely sure what you're going to get. This may surprise some people, as the general understanding of militia is that we kill the 'same' people over and over again: the Amarr. But it's true--pvping in militia is like riding on the backseat of a roller coaster blindfolded while trying to shoot the people in the front seat who are also blindfolded, trying to shoot you back. Many stories in militia start with "So, I undocked my thrasher..." then go in epic Eve loops of shipping-up,to destroying, to drama, to raging, to tears, to sighting some random neutral warping to the planet, to getting bored, to killing a pos, to saving a friend, to anywhere and everywhere else after that to end with..."and then the titan smashed me to smithereens. You just never know what the night will bring. Well, last night brought a few bc kills that smurfsbrigade didn't seem to happy about. They came back in 5-6 abaddons with 2 guardians and a falcon, and camped the gate to huola. A while later Manos logged on, and started a fleet. The thing you have to understand with Manos is that he hates fcing--with a passion. But, he's darn good at it, and has one of those "you will listen to what I have to say" kinds of voices that can sometimes encourage less competent pilots to be less fail. At any rate, we were getting in bses and we were going to go roll them. End of plan. We formed up with roughly a dozen or more pilots, and tromped over to Auga. They waited for us in Amamake, and we leroyed into them--a true romple stomping of a group as you ever saw. And they ran. Well, of course they did. Lately we've been AFK and inactive like crazy so it was like stampede of the just awoken, sleepy bulls. I'd be scared too. We chased them back to Kamela and waited patiently for them to get more numbers to make themselves feel safer. It took them a while but they brought back 8 abaddons, 4 guardians, probably another 8+ bses including a scorpion, and some random other stuff. Our own fleet had grown as well, as more people were logging on. They took a detour to Auga at first--it's possible that their scout didn't notice the huge cloud of drones and mess sitting on the huola/kourm gate. They finally came. And they sort of 'fought' us. I'm not sure that it could be called...'fighting' really. Our perspective of their approach was more like "Oh God, our fc just told us to warp to you but we all did it against our will and will sit here now unsure what to do or whether we want to follow his orders anymore and aggress you"
And then we dropped the archon. Because we wanted to. They had 4 guardians after all. And then it was deer in the headlights. Some kept aggressing, some warped away or jumped, until they finally all started to run away. To be fair, we had more repping power. However, if they had taken what they had and used it right, they probably would have gotten a cap kill, and held the field. But...they didn't. [01:51:42] Jackman2232 > are any of you def? [01:52:06] Mystical Might > Jackman = bitter because his failfit geddon got wtf pwnt. [01:52:40] Mystical Might > You do. [01:54:53] Mystical Might > if you fit your ship like undertovv, you're worthless. [01:55:03] Mystical Might > If you can't set your fleet correctly, you're retarded and worthless. [01:55:19] Mystical Might > Tired of le whine. [01:55:27] Mystical Might > sure is. [01:55:31] Mystical Might > i'm tired. [01:57:33] Mystical Might > said that as if I'll give a - about your QQ on vent. [01:58:14] Mystical Might > QQ moar. [01:58:49] Mystical Might > Door. [01:59:17] Mystical Might > You can go join goonswarm or test . I'm sure they'd just LOVE to have the failfit geddons you bring to le table. [01:59:40] Mystical Might > Confirmed, I mad. [02:01:00] Mystical Might > because you're terrible? Needless to say, the Amarr weren't interested in doing much with us after that point. Not until someone else could log in and tell them what to do. It quieted down a bit until Manos was jumping something 7-8 jumps away and a thanatos aggressed him on a station then warped away. After doing some recon with a friendly in local, they somehow tracked the thanny to a small pos in system. And we were all bored. All dressed up, and nowhere to go. So, it was going to die. 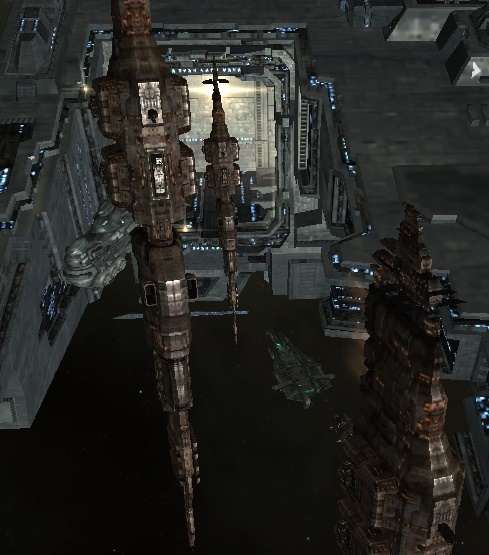 We all jumped into carriers and dreads (exact numbers i sekret) and jumped into olfeim to start pounding on the tower. I even dropped my own thanatos and practiced repping targets. Behold the maiden voyage of a Susan-driven capital! So, you have the picture right? We're shooting a small pos in low-sec with a random rabbling of super sweet capitals. Basically, all we lacked was the big red target on our foreheads. We knew it. We didn't care. What seemed like eons later (I hate shooting poses, and I hate caps and I hate fuel, and I hate big ships, and I wanted to go home.) 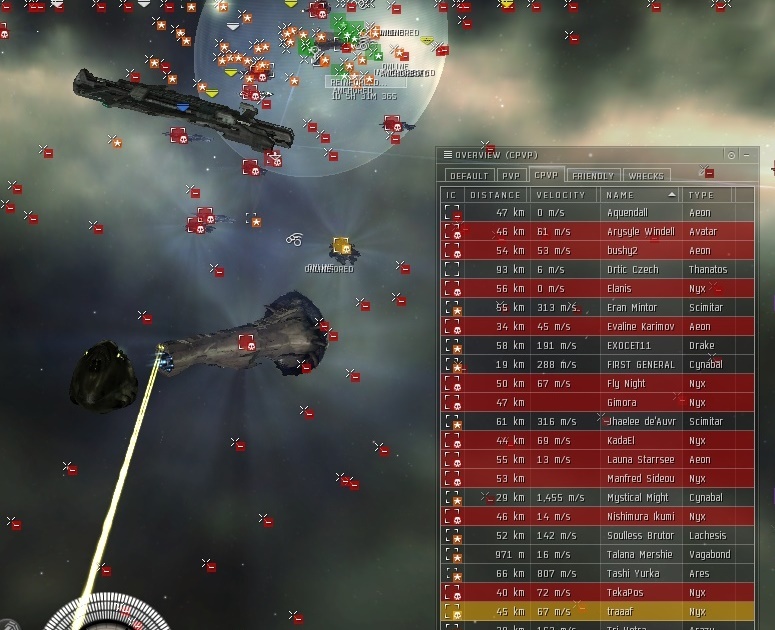 an Amarr hac gang was reported as heading this way. (A Predator Elite gang.) We were about done with the tower so as they jumped in we warped to station, or jumped back to huola. Unfortunately, one guy got caught just as he came out of siege. It was time for us all to come back in and save him, of course. I dropped the nearest hurricane i could find in my bay, and jumped back to system to quickly reship. Unfortunately, I realized it was unfit and I was stuck in my carrier. I ended up not undocking because I couldn't use the capital energy Transfer yet, which was what was really needed. There were plenty of other logistics on the field. Manos said he had a spare mega and would drop it if I warped to him so I could start putting some dps on the smaller targets. I could finally get out of my thanatos! Hurray! Ever have one of those near death moments where your entire life flashes before your eyes, but when it's over only a few seconds have gone by? Neither have I, but it sure sounded like some other people were having that moment on voice coms. The local spike was PL, of course. In the time it took me to undock and warp to the field to get my megathron, every capital on the field was dead. There was a huge mess of drones, 12+ nyxes and at least one titan on grid as my pod came to a grinding halt. I turned my little podski around and skidaddled. I don't think I've heard people laugh that much on voice coms since I joined Minmatar. 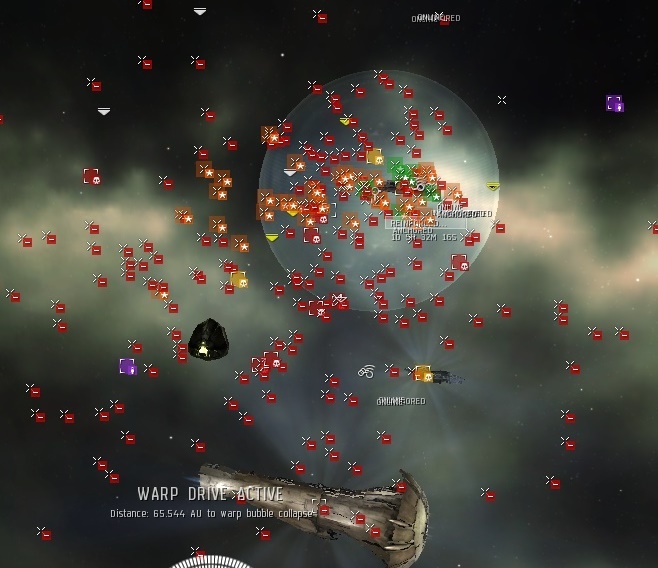 Party in PL's PWN channel! Well, it was dumb actually but I LOLed. Especially when they started trying to kick people and couldn't keep up so they just made the channel un-public and kicked everyone. Nothing like being trolled in your own trolling channel. And, that was about all. And, for those of you who ask me what faction war is 'like' you will see that there is no easy answer. You'll just have to join, either side, and find out. *Side Note: None of dreads were killed during this fight, only a few of our carriers. The POS was put into reinforced before PL arrived. 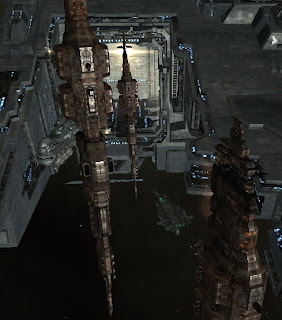 We took out a significant portion of the Amarr fleet before PL arrived including several shiny ships, even though we were not exactly equipped to fight small stuff. PS--your posts have pushed me over the edge. I finally bit the RF EMP-L and used The Power of Two to start a whole new account.... the main on it is Minnie and will be joining FW as soon as I'm done with the basic skillingz. Figured it'd be nice to learn a new part of the 'Verse, and there'd be virtually no chance of "conflict of interest" vs my main and alt (both Gal) on my 1st account.